A young, Papua New Guinean female pilot has made history by becoming a first woman to have achieved her command on Dash 8 aircraft under Air Niugini’s pilot cadet program. Captain Beverly Pakii’s achievement is the first for the airline since Air Niugini’s pilot cadet program started in the 1970s. From a mixed parentage of Enga and Morobe, the 29 year old Captain operated her first commercial flight on 12th March 2015 from Port Moresby to Lihir in New Ireland then continued to Tokua airport in East New Britain and back to Port Moresby. The flight was on Air Niugini’s subsidiary company, Link PNG’s Dash 8 aircraft. Captain Pakii started with Air Niugini as a cadet in 2004. She completed her training at PPT Flying School at Coffs Harbour, New South Wales, Australia where Air Niugini sends its cadets every year. After completing her studies, Miss Pakii returned to Air Niugini in 2006 where she operated as a First Officer on Dash 8 aircraft to make the hours as required for all cadets. After meeting the minimum hours, she underwent command practice in preparation to becoming a captain. The vigorous and comprehensive pilot training processes took the young pilot 10 years before achieving her command on Dash 8 aircraft. The Dash 8 aircraft as we know are operated by Air Niugini’s subsidiary company, Link PNG. Air Niugini also has its own internal pilot training program that is comprehensive and detailed that the pilots go through before they are confirmed to their positions. Beverly’s father, Capt Ted Pakii was an ex Air Niugini pilot who joined the airline from the PNG Defence Force in 1994. He operated on several aircraft types during his time, starting with Dash 7 and left after achieving his command on the Boeing 767. 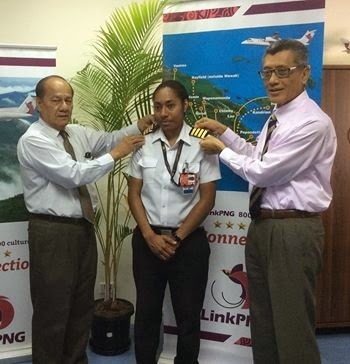 Air Niugini currently has 50 cadet pilots including 5 females, of which Capt Pakii is one.